The stock market is a dynamic beast, extremely unpredictable at times and sometimes a passenger on a rollercoaster of investor emotions. These emotions can be the catalyst that leads to deviation from a long-term picture. Statistics of investor behaviour has shown investors switching out of equity following a market decline and buying when the market has rallied, often when nearing its top. This type of investor behaviour of selling low and buying high is evident in fund flows. The same rules may be applied to the flows between actively managed funds and passive index trackers. Data suggests a hunt for outperformance, leading to switches at the wrong time, for instance, moving from active to passive before a period of outperformance by active managers. 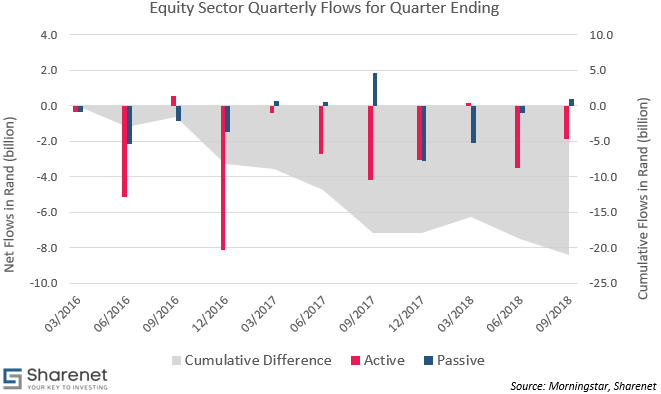 The fourth quarter of 2016 saw R9.6 billion leave the equity sector, the largest net outflow out of the 11 quarters from January 2016 to September 2018. The All Share Index then went on to return 21% in 2017. Investors chose the worst possible time to switch out of equity. Since the start of 2016, there has been a net outflow from South African equity funds and ETFs of R36.5 billion. Approximately 79% of net outflows came from actively managed funds. The cumulative difference (below chart) in outflows from active vs passive funds shows substantially more withdrawals from active funds. Since January 2016, investors have cumulatively withdrawn R21 billion more from active funds than their passive peers. Is this another ill-timed switch by investors? Market conditions change and some managers will benefit if their particular investment management style is one that flourishes in the prevailing market. That is why we so often see funds that had a stellar year, perform poorly the next. It adds to the argument that portfolio managers shouldn’t be analysed on only their short-term performance. Managers with a value bias might outperform in 2018, while those with closer characteristics of a growth style were on top in 2017. 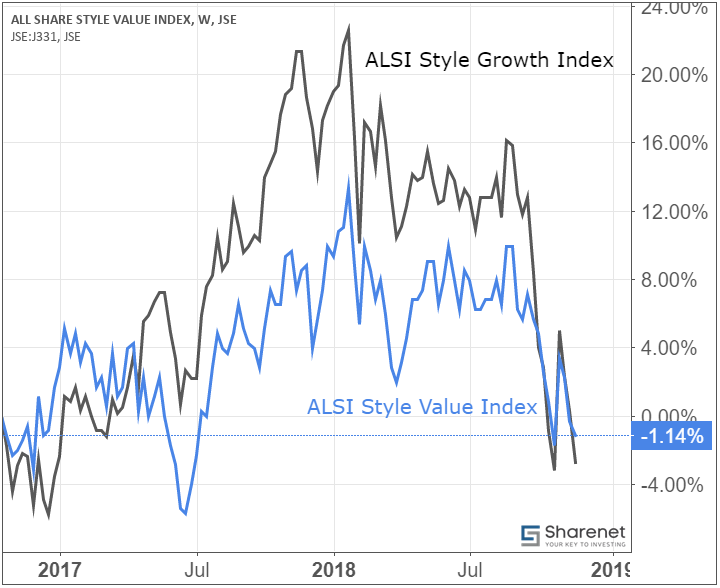 The below chart shows how a growth style was superior in 2017, but is being humbled this year. Market conditions can hence favour one group of managers with a certain investment style. This can also be applied to actively managed funds versus passive index trackers. An index is constructed to measure performance and may inadvertently be biased to an investment style that may benefit from certain market conditions. I took all actively managed funds in the ASISA Equity General sector with at least a 10-year track record and compared their 12-month rolling returns to that of the All Share Index. Over the past 10 years, an average of 35.6% of active managers managed to outperform the All Share Index when looking at 12-month rolling returns. Using 12-month rolling returns as our performance metric allows us to see during which periods active managers beat the index and it places less weight on recent underperformance, which will be reflected in all historic returns. Since 2017, active managers struggled to beat the index. A large contributor to this statistic was the substantial weight that Naspers had in the index, far higher than most fund managers would be comfortable holding in their portfolios. Before 2017, the average outperformance was 40.1%. This figure will be even higher if you use a passive index tracker (which also pays fees) instead of just the index. I wrote an article on why you should compare the performance of actively managed funds to index trackers instead of just the index, which I think is an interesting read if you want to analyse active and passive funds. You can find the article here. 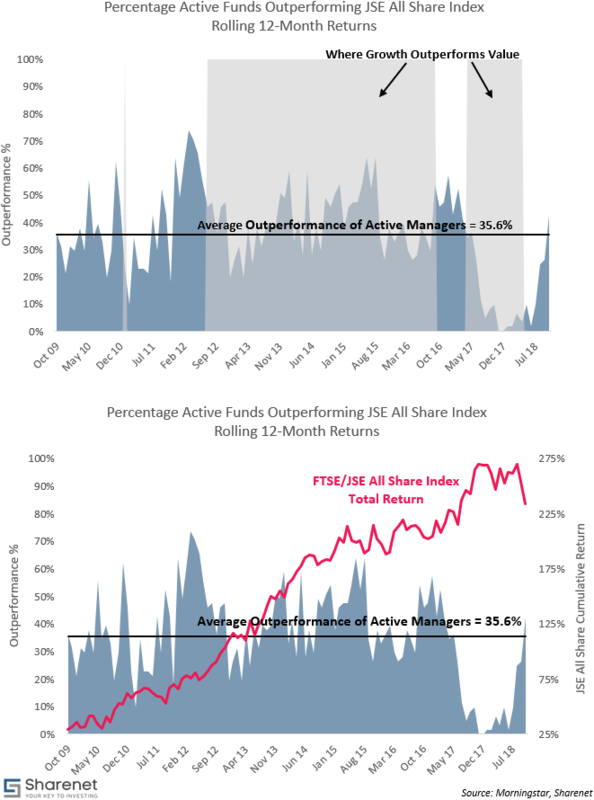 Notice from the above chart how the number of active managers outperforming the market index is increasing, currently at 42.6% (above the average). Over the past ten years there have been numerous instances where the majority of active managers outperform the index. In early 2012, around 70% of active managers were beating the index. Active managers seem more able to deal with the tough market environment than passive index trackers. Investors should be aware of the cyclical nature of the market and acknowledge that no fund (active or passive) can always deliver the best performance. It’s important to avoid the temptation of hunting returns since a fund that’s beating all others in the current market, may be ill-equipped to outperform in the coming market environment.